Sand and stone are Earth’s fragmented memory. Each of us, too, is a landscape inscribed by memory and loss. One life-defining lesson Lauret Savoy learned as a young girl was this: the American land did not hate. As an educator and Earth historian, she has tracked the continent’s past from the relics of deep time; but the paths of ancestors toward her—paths of free and enslaved Africans, colonists from Europe, and peoples indigenous to this land—lie largely eroded and lost. In this provocative and powerful mosaic of personal journeys and historical inquiry across a continent and time, Savoy explores how the country’s still unfolding history, and ideas of “race,” have marked her and the land. 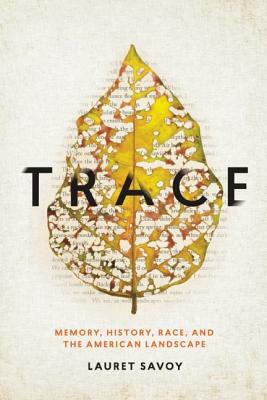 From twisted terrain within the San Andreas Fault zone to a South Carolina plantation, from national parks to burial grounds, from “Indian Territory” and the U.S.-Mexico Border to the U.S. capital, Trace grapples with a searing national history to reveal the often unvoiced presence of the past. In distinctive and illuminating prose that is attentive to the rhythms of language and landscapes, she weaves together human stories of migration, silence, and displacement, as epic as the continent they survey, with uplifted mountains, braided streams, and eroded canyons. LAURET SAVOY is a woman of mixed heritage, and a professor of environmental studies and geology at Mount Holyoke College, where she explores the intertwinings of natural and cultural histories. She writes about the stories we tell of the origins of the American land and the stories we tell of ourselves in this land. Her books include The Colors of Nature: Culture, Identity and the Natural World; Bedrock: Writers on the Wonders of Geology; and Living with the Changing California Coast. She lives in Leverett, MA. For more information, visit www.readtrace.com.